"I can give you a drop of heavenly tenderness and I can give you rest. You will be a genius of bright-eyed cleverness. As your image I am blessed." Little is known about Vladimir Megre's early background, apart from a few experiences he himself describes in the context of his writings. One of these occurred in the 1960s when over the course of a year the teen-aged Megre made periodic visits (as inconspicuously as possible) to a monk named Father Feodorit at the Trinity-Sergiev Monastery in the town of Sergiev Posad (then known as Zagorsk), just east of Moscow. These meetings (described in Chapter 24 of Book 2, The Ringing Cedars of Russia (pp. 119-31) left a lasting impression on the young Vladimir's consciousness, and can perhaps be taken as a prelude to his later spiritual transformation during his meetings, as he describes them, with Anastasia in the Siberian taiga. We know that by the mid-1980s Megre was married with a daughter and living in Novosibirsk, where, like many other budding Russian capitalists, he took advantage of perestroika and the subsequent collapse of the communist system to launch into an entrepreneurial career. Even before perestroika he had shown his business acumen in finding ways to significantly increase the profits of a photographic collective. He went on to form a number of commercial co-operatives and by the late 1980s had leased a fleet of river steamers which plied the waters of the Ob River north of Novosibirsk. (see Chapter 1 of Book 1, Anastasia). On one of these trips north in 1994, he encountered two elderly gentlemen who told him of a cedar tree (kedr in Russian, more commonly known as the Siberian pine in English) deep in the taiga forest that was making a 'ringing' or humming sound, which meant it was near the end of its centuries-old life and was ripe for cutting up and giving out pieces to those interested in its remarkable healing properties. He decided to return to the area the following year (1995) on his own to investigate. In place of the two elderly gentlemen he discovered a young woman in her twenties who said they were her grandfather and great-grandfather, and offered to take him to the cedar they had described. She turned out to be a recluse who lived all alone in the taiga, with no other company or facilities (including housing and food supply) than those provided by Nature. But that was just the beginning. During the three days Megre spent with her in the taiga, she revealed to him not only the secrets of the ringing cedar, but many mysteries of Nature and the Universe - especially their role in the Divine order of things - that had been known to people in so-called ancient times but subsequently lost to mankind. Much of the earlier knowledge had been deliberately consigned to oblivion by so-called 'wise men' who felt their own sophisticated world-view threatened by the simple wisdom of their forebears. At his new acquaintance's insistence he reluctantly abandoned his business career and set about writing a book about his taiga experiences (but only after he became penniless trying to set up a league of ethical entrepreneurs and only after his marriage failed, although he received help from a number of Moscow university students as well as his grown daughter Polina). The book, entitled Anastasia, was published in 1996 - largely thanks to the generosity of the manager of a print shop Megre had shown it to - and sold by the author himself in Moscow subway stations. Then an incredible turn of events suddenly took place. A great number of those who purchased the book returned right after they finished reading it (or even before) to buy copies for their friends and neighbors, and the first print-run of 2,000 copies sold out in a very short time. A generous donor financed the next printing, before a recognized publisher caught wind of its success and launched it into mass production. (The Russian editions of the Ringing Cedars Series are now published by Dilya Publishers in Moscow & St-Petersburg.) And one copy of the first printing even ended up in the United States Library of Congress collection. 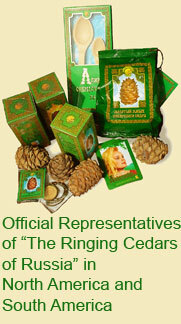 The success of Book 1 prompted the author to write a second volume, The Ringing Cedars of Russia, which offers, among other things, a fascinating behind-the-scenes look at the story of how Anastasia came to be published, as well as a deeper exploration of the concepts revealed in the first book. Subsequent visits to Anastasia in the taiga - including conversations with the son she had conceived together with the author - engendered even more books, which now number eight in the original (the last one running into two volumes). By 1999, only three years after the first book appeared, Vladimir Megre had become modern Russia's most widely read author, with his writings selling in the millions. At the end of Book 3, The Space of Love, may be found a thumbnail sketch of the "Series at a glance", as well as a brief description of the background to the series and profiles of the author, translator and editor. It is interesting to note the change in the author's style over the course of the books. According to his own admission, before his taiga adventure this hard-nosed businessman had never written a word of prose or poetry before in his life, but he reluctantly launched into writing a book at the insistence of Anastasia. He admits his initial prose did not sound professional, which only aggravated his difficulty in getting his first book to press. This prose may well be described as 'choppy' and simplistic, but over the first few books - under the influence, he says, of Anastasia - his writing gradually developed into a style more and more polished and professional. By the latter part of Book 3, entitled The Space of Love, and throughout a good part of Book 4, Co-creation, his dialogues with the Siberian recluse take on the quality of poetic prose, including elements of met re and even rhyme. These features have been preserved as much as possible in the English translation.